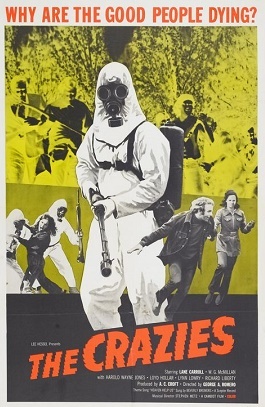 The Crazies is the kale of horror movies. It’s not particularly exciting, but it’s good for you. Bio-horrors are a terrific social experiment where citizens have to band together to fight off an external force, usually a virus that threatens to kill us all. And to compound matters, communication has broken down, especially between those tasked to protect us, and how they convey said message. Spoiler alert: not very well. Rounding up people for quarantine, not telling them why, and doing so very violently, doesn’t do much for social cohesion. And there’s an immediate push-back. 1) Efforts by a stentorian researcher to find a cure, using makeshift conditions of a high school science lab and trying to secure blood samples from the increasingly rabid and sociopathic townies to send back to Maryland for processing, and…. 2) survivors/resistors/militia who are trying to escape the clutches of NBC suit-wearing soldiers with shoot-to-kill orders, by fleeing to a neighboring town. It’s the science part of the tale where things break down, much like the social cohesion and the institutions that are meant to make people safe. It’s simply not as compelling a tale as a survivor’s fight for their very survival. There’s something undeniably creepy about NBC/Hazmat suits, gas masks and a bunch of men running around doing the unquestioned bidding of higher ups. However, at the end of the day there are serious pacing issues and, despite the inherently interesting survival tale, the survivors themselves are not particularly compelling. Much like zombie threat movies, they’re forced to close ranks when one among them is thought to have been afflicted. 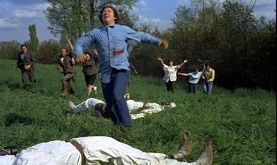 It’s hard to separate out one’s critical response to The Crazies given when it was released, as these kinds of films have been done to death so often now. But it’s important to start somewhere, in this case 1973.